What an adventurous, explosive, and intense psychedelic freakout this is. Sky Saw is the collaboration of Boston musicians Core Redonnett on zither, loops, and electronics and Yuri Zbitnoff on drums and percussion, though guest Jonathan LaMaster of Cul-de-Sac makes a significant contribution on violin as well, playing on all of the tracks on the album. And if that sounds like an intriguing and dynamic mix of instruments, it is. On four tracks, ranging in length from 11 ½-minutes to 21-minutes in length, the three virtuoso musicians weave a mesmerizing and hypnotic tapestry of sound. Now if you hear the word "zither" and thoughts come to mind of, say, the mellow, space meditations of Laraaji, you will definitely be surprised when you hear this album. There's nothing meditational about this, other than the fact that each piece is built around the fascinating and hypnotic rhythms of Zbitnoff. Redonnett absolutely rocks on zither, slathering acidic noise and squalling sonic explorations through the mix. And LaMaster is equally comfortable at delivering howling violin pyrotechnics as he is at playing it smooth, high and haunting, with hints of distant, mysterious lands. The music on Sky Saw's debut is sometimes noisy, sometimes exotic and evocative, as all great psychedelic jams should be, but because of the unique combination of instruments, it sounds wholly refreshing and new, rather than rehashing rock jams of the past. This is daring and electrifying psychedelic music for the 21st century. 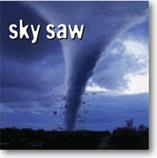 For more information you can visit the Sky Saw web site at: http://www.sky-saw.com. Visit the Lithiq web site at: http://www.lithiq.com.